This Laser Ray Box produces five parallel and sharply defined laser beams to demonstrate light's interaction with other equipment. It is great to demonstrate light bending or focusing due to Refraction and Reflection from mirrors, Fresnel reflections from uncoated lens surfaces, the Monochromatic nature of laser light and Total Internal Reflection. The five laser beams are 1.5cm apart with a wavelength of 650nm. The base of the box has a magnet allowing it to be easily attached to a horizontal or vertical surface. Fully portable as it's powered by rechargeable Ni-Cd batteries and can be recharged with the supplied mains adaptor. 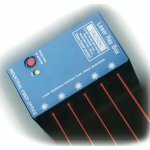 This is a Class 2 Laser product with no single beam exceeding 1mW. IF-583 Laser Ray Box out of its storage case. IF-583 Laser Ray Box out of its storage case shown with IF-551 lens set.